During April every course is discounted 40% which means you can SAVE up to $1,978 off standard tuition. 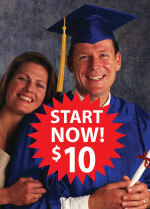 Every course includes a low monthly payment option plus you can start any course for only $10. Each course includes full instructor support, on-line exams and many have hands-on labs. Call an Admissions Advisor at 1-800-243-6446 or enroll online. Hurry, offer ends April 30th. Learn to design, install and manage computer security systems. Learn how to design, install and manage computer security systems. Learn to troubleshoot computers and prepare for the A+ Certification. Learn to install, maintain, troubleshoot and support a network. Learn to operate a PC and use Microsoft Office. Covers Electronics, Robotic Controls, Automated Systems & PLCs. Learn to troubleshoot electronics equipment used in Broadcast Engineering and get familiar with new mobile media technologies. Advanced-level course designed for technicians who want a deeper understanding of electronic circuits and advanced mathematics. Entry-level electronics course with over 200 hands-on training experiments using CIE's Personal Training Laboratory and Multimeter. Learn Electronics with Digital and Microprocessor labs. Get the skills needed to maintain, repair and program industrial electronic equipment. New Allen-Bradley PLC simulation lab. Get a strong foundation in electronics then move on to Wireless and Personal Communications. Security, Bluetooth, WLAN and more. You will find that most of CIE's courses are designed around a core of lessons that cover basic theories applicable to many areas of electronics and computer technology. Course 14B for instance, all contain the same initial 93 lessons that together comprise Course 1B. 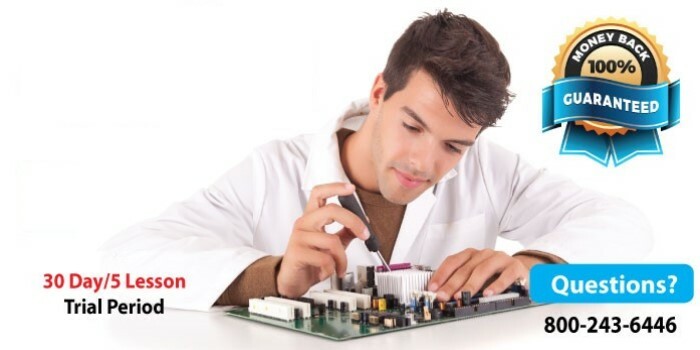 This is the course that teaches basic electronics, and goes on to increasingly more advanced lessons. For those individuals who already possess some electronics knowledge, CIE has designed several specific courses. Our intermediate level courses include courses 2, 4, and 5. Course 6, "Electronics Engineering," is an advanced level course. You can pick up where your previous electronics training left off, or update your present skills. Our non-laboratory courses can be the answer to upgrading your skills to the desired level. CIE has a study method that's so good, so innovative, it's patented. It's called the AUTO-PROGRAMMED teaching method, and it did nothing short of setting a new standard for education through self-study. AUTO-PROGRAMMED lessons allow you to learn electronics one step at a time, and you determine the size of the step. As a CIE student, you can train on your own laboratory equipment, which assures you that you can practice whenever you like, and repeat experiments as often as you need, to master them. CIE's dedicated staff of instructors do more than just grade your exams; they help guide you, step-by-step, through your studies and hands-on training. They personally review each written lesson report. They'll encourage you when you're doing well, and give you support when you need it. Most importantly they'll see that every question you have receives careful consideration by one or more members of the staff. You can be sure the response, whether it's a simple explanation or an in-depth theoretical discussion, will be prompt, courteous, and thorough. When you finish a lesson you can take your exam on-line on CIE's e-grade Web site anytime you want - day or night! Your test will be processed and your score e-mailed back to you. There is no formal campus or classrooms at CIE, but you will find all the educational resources of a traditional residential education center here. We provide the opportunity to purchase optional lab equipment and an array of school items and lesson grading is available online with our special eGrade site (www.study-electronics.com). Students who enroll in courses 2, 2C, 3C, 4, 4C, 5, 5B, 6, 6C, 7C and 14B are responsible for purchasing a limited number of textbooks that are not included in tuition. Please call an Admissions Advisor at (800) 243-6446 for the current list of textbooks that need to be purchased for these programs or click here to view them now.